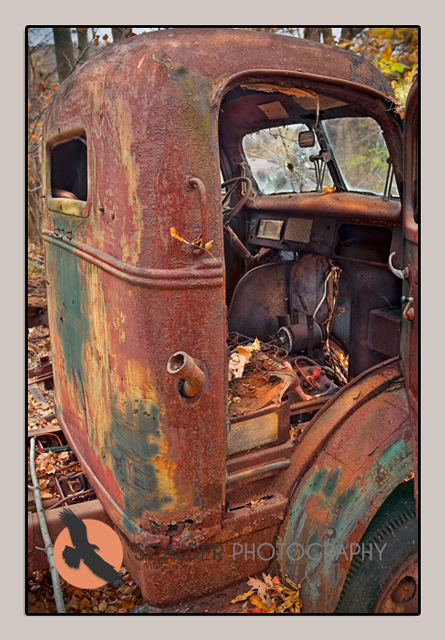 I happened upon this old rusted truck outside an abandoned saw mill in the rural mountains of West Virginia. Bull dozers, old steam engines and World War II military trucks and the crumbling building told the story of a hardscrabble business of days gone by. The lighting was very difficult because it was a cloudy day compounded by being in the woods with vegetation all around limiting the kinds of images I could capture. I used a long exposure with off camera electronic flash. This entry was posted on Wednesday, April 18th, 2012 at 10:43 pm. It is filed under Animals / Wildlife, Landscape, Nature, New Images and tagged with abandoned, Americana, Appalachia, Appalachian mountains, forest, mountains, nature, rural, rusted, truck, USA, woods. You can follow any responses to this entry through the RSS 2.0 feed.